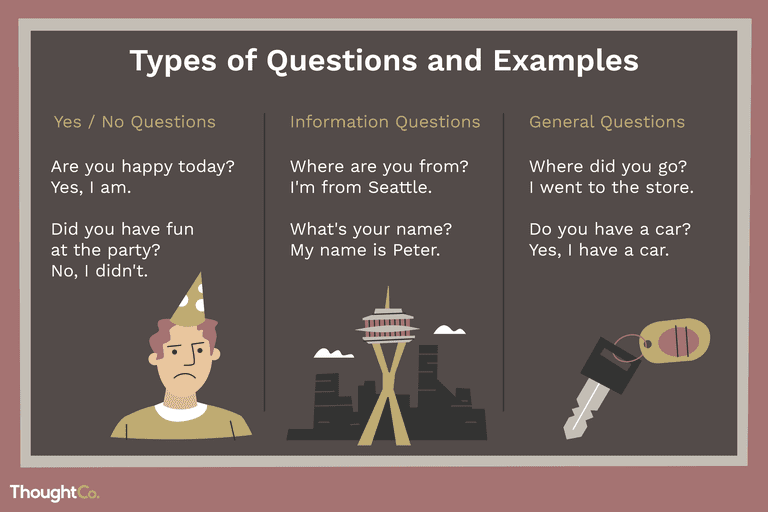 There are two main types of questions in English: questions that can be answered with a simple yes or no, and questions that require a more detailed response. Are you happy today? Yes, I am. Did you have fun at the party. No, I didn&apos;t.
Will you come to class tomorrow? Yes, I will. Information questions are asked with the question words what, where, when, how, why, and which. These questions require longer answers to provide the specific information requested.Notice that each of these questions are answered with the positive or negative form of the helping verb. Where are you from? I&apos;m from Seattle. What did you do on Saturday evening? We went to see a film. Why was the class difficult? The class was difficult because the teacher didn&apos;t explain things well. Jane: Nothing much. How are you? What's your surname / family name? What do you do? / What's your Job? Here's a short dialogue giving an example of personal questions. You can use these questions to practice with a friend or a classmate, using your own information. Alex: Can I ask you a few personal questions? Peter: I live at 45 NW 75th Avenue, Phoenix, Arizona. Alex: What's your cell phone number? Alex: And your email address? Alex: When is your birthday? Peter: I was born on July 5, 1987. Peter: Yes, I am/No, I'm single. Alex: What's your profession?/What do you do for work? What did you do [next]? Do you have a car / house / children / etc. ? Kevin: Where did you go last night? Jack: We went to a bar and then out on the town. Kevin: What did you do? Jack: We visited a few clubs and danced. Kevin: Can you dance well? Jack: Ha ha. Yes, I can dance! Kevin: Did you meet anyone? Jack: Yes, I met an interesting Japanese woman. Kevin: Can you speak Japanese? Jack: No, but she can speak English! Here are some common questions that will help you when you go shopping. Do you have something bigger / smaller / lighter / etc.? Shop Assistant: How can I help you? / May I help you? Customer: Yes. I'm looking for a sweater like this one, but in a smaller size. Shop Assistant: Here you go. Customer: May I try it on? Shop Assistant: Sure, the changing rooms are over there. Shop Assistant: How would you like to pay? Shop Assistant: Certainly. We accept all major cards. Questions with "like" are very common, but they can be a little confusing. Here is an explanation of each type of question with "like." What do you like? Use this question to ask about hobbies, likes and dislikes in general. What does he look like? Ask this question to learn about the physical characteristics of a person. What would you like? Ask this question to find out what someone wants at the moment of speaking. What is she like? Ask this question to learn about a person&apos;s character. John: What do you like doing in your spare time? Susan: I like hanging out downtown with my friends. John: What does your friend Tom look like? Susan: He's tall with a beard and blue eyes. John: What is he like? Susan: He's very friendly and really intelligent. John: What would you like to do now? Susan: Let's go hang out with Tom! Once you understand these questions, try testing your knowledge by taking this Understanding Basic Questions in English quiz.